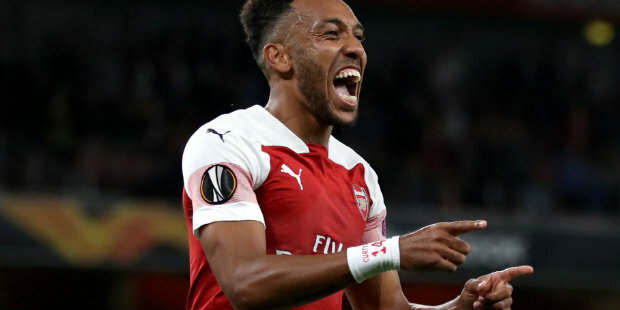 Pierre-Emerick Aubameyang may have scored with each of his last 10 shots on target but the Arsenal striker insists there is even more to come. The Gabon international netted twice in Arsenal’s 4-2 victory over Tottenham on Sunday in an enthralling north London derby that was overshadowed by seven arrests. One of those arrests came after a banana skin was hurled from the away end as Aubameyang celebrated scoring an early penalty in front of the Tottenham fans. Spurs hit back to go into half-time ahead courtesy of an Eric Dier header and a Harry Kane spot-kick. But Aubameyang went on to equalise, with Arsenal wrapping up the points through Alexandre Lacazette and Lucas Torreira strikes. Aubameyang is now the Premier League’s top-scorer for the season with 10 goals and believes he can get even better. Speaking before the incident surrounding his first goal celebration came to light, Aubameyang said of his recent statistics: “Not bad, eh? “I think I’m not at 100 per cent but it’s coming. It’s coming and today I felt very good on the pitch. I’m really happy because my best form is coming. “We played like a team and we did it well tonight. That’s what I like about the Premier League, of course. Aubameyang sits two goals clear of Kane, as well as Manchester City duo Sergio Aguero and Raheem Sterling, as the league’s leading marksman. He believes he belongs in such illustrious company but admits winning the Golden Boot will be a tough challenge. “I hope so. I think so, yes,” Aubameyang replied when asked if he felt he was at the same level as the likes of Kane, Aguero and last season’s top-scorer Mohamed Salah. “It’s early in the season. I know that we have good strikers in the league so it will be tough (to win the Golden Boot). But I’m happy that we won today. The most important thing, as I always said, is the team. Aubameyang’s goal record is all the more remarkable given he has found himself shunted out wide on the left on many occasions as head coach Unai Emery looks to fit both him and Lacazette into the same side. He has started the last two games as the main striker and admits that is where he prefers to do his work. Be the first to comment on "Aubameyang convinced he can get even better"